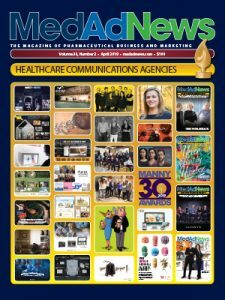 Pioneers who are steering innovations in pharma advertising, clinical trial imaging, and R&D are the focus. Donna Murphy, who has spent 30 years with Havas evolving its North American professional agencies, was named global CEO. Murphy has long critically eyed the silos that have separated professional advertising and consumer health and wellness advertising, so having that view backed up by Havas Group CEO Yannic Bollore was welcome. Murphy’s pedigree and experience in professional healthcare advertising cannot be disputed. She joined Euro RSCG Life Worldwide in 1987. Formerly with Goldman Sachs, Murphy became the chief financial officer of RSCG North America, focusing on Group Acquisitions and Financial Management. In 2003, she became the chief operating officer of Euro RSCG Life Worldwide. She played a key role in the growth of the global network, launching the start-up of all specialized services (public relations, medical education, interactive, managed care consulting, and sales training) as well as overseeing and integrating all of the major acquisitions. Murphy was named worldwide managing partner in 2007 and led the network to new levels of organic growth and momentum. Along with her former partner, Doug Burcin, she had responsibility for the Havas Health Global network, which then consisted of 60 offices and 2,000 employees worldwide. In 2008, Murphy and Burcin were awarded Med Ad News Advertising Persons of the Year. The decision to combine the professional and consumer businesses within Havas was made after a good look at the market, Murphy says. “We looked over the market and we looked very closely at what is happening, not only with what’s happening but what our clients need from us,” Murphy says. The new Havas Health & You has 4,000 employees in 70 countries, focused on health and wellness. It was not difficult to convince pharma clients to get on board with the concept. Havas Health & You already had a model for combining its professional capabilities with that of consumer agencies, through the “Together” concept pioneered by Havas, which has seen the company focus on the creation of “villages” housing all disciplines – creative, media, data, content, technology, and design – with the aim of fostering collaboration between agencies. There are several goals for Havas Health & You in 2017, Murphy says. Some of that investment comes from acquisitions by Havas Group. There have been three so far in 2017, including the June acquisition of Sorento, the largest health and wellness agency in India; and in July, the acquisition of the healthcare communications agency SO What Global in the United Kingdom. Murphy says agency acquisitions are not done just to make the network larger. “The acquisitions, we do it for a strategic reason, not to add an agency,” she says. “So yes, we’re making huge investments in acquisitions that are strategically appropriate, we’re also making huge investments in talent and innovation, and in our proprietary tools. When it comes to Havas Health & You’s positioning – “the corner of healthy and living” – Murphy says other agency networks may have a claim on health, or wellness, not both. The launch of Havas Health & You has been smooth, Murphy claims. It will be interesting times ahead for Murphy and Havas Health & You as parent Havas Group has been acquired by global media group Vivendi. Vivendi, the owner of Universal Music Group, Canal+, and videogame developer Gameloft, brings enormous capabilities not only to Havas Group but Havas Health & You. The extended capabilities from Vivendi came into play for Havas Health & You when trying to meeting the challenges from a client in Brazil. The client, Reckitt Benckiser, had partnered with Brazilian public health agencies to raise awareness of what people needed to do to prevent infections – use mosquito repellent and get rid of standing water – in the rise of the Zika epidemic. Reckitt Benckiser makes several mosquito repellent products. “In a matter of two weeks, we got the number one star in Brazil, who is similar to Lady Gaga in the United States, an original song was written, we had a commercial on the air, ‘Clap for Brazil,’ an original song and dance movement that would pull through the whole country, in reference to using appropriate insect repellents for Zika, as well as moving standing water and the things you need to do,” Murphy says. “Clap for Brazil” or “Palmas Pelo Brazil” features Grammy-winning artist Ivete Sangalo, and was created by Havas Brazil with Havas New York, BETC Brazil, and Havas Media UK, with Sangalo courtesy of Universal Music Group. As of May 23, the campaign garnered more than 11.2 million social engagements and 9 million music video views. “That’s the power of Havas and Vivendi, and that’s extremely important,” Murphy says. Vivendi’s Gameloft will also be part of a joint venture that will produce health and wellness apps for Havas Health & You clients, Murphy says. “It will be a venture that focuses on gaming apps to promote healthy living,” she says. Usually a major acquisition such as that by Vivendi has repercussions down the line, especially with personnel shakeups among subsidiaries, but Murphy plans on sticking around for the long term. How does one go from being CIO of a global conglomerate with verticals in fresh cut flowers, salmon farming, and cable telecommunications, to the head of a company that is the premier transporter of digital images in global clinical trials? According to Abraham Gutman, the president and CEO of AG Mednet, it started as a question raised at a barbecue. But first there was a previous company. As Gutman describes it, think of compression and expanding compressed files in light of the flat, dried sponges you can get, a piece of what seems to be cardboard that expands into a full-size sponge when water is poured on it. “Now in the sponge, it doesn’t create any kind of lossiness, but when you do certain types of jpeg compression you lose resolution,” Gutman says. Not being able to view all the tiny details in an MRI or CAT scan or sonogram would obviously be problematic. Gutman set his mind to the challenge. What he thought he was building at the time and what became AG Mednet are two different things, he admits. “I was going to essentially say to hospitals that didn’t have radiologists or didn’t have enough radiologists, ‘You can put your scans on my network,’ and I was going to go to some radiologists that had some time to read extra scans a day, to put themselves on the network, and I would match radiologists to scans, and arbitrage, get a cut from both. Then, as luck would have it – “and I think I have had a lot of that in the last 10-plus years” – Gutman was contacted by Brigham and Women’s Hospital in Boston. The hospital wanted to use his network to move emergency radiology images to its affiliates in Massachusetts. “So they put 14 or 15 hospitals on our network and we began moving images,” Gutman says. “I had no clue,” he admits. Within three months, Gutman’s system was deployed at the top 20 hospitals conducting clinical trials in the United States, including the Cleveland Clinic, the Mayo Clinic, NYU, Mount Sinai New York, Cedars Sinai in Los Angeles, and MD Anderson. The company developed a new front end to the network and released it in October 2008. In November, Gutman got another call, this time from someone at GlaxoSmithKline, who wanted to use AG Mednet to collect images from a 5,000 patient clinical trial taking place at about 300 sites around the world. “Long story short, they became our first customer in clinical trials and are still a customer,” Gutman says. With GSK as a customer, AG Mednet got out of radiology and dedicated itself to clinical trials. In short, AG Mednet had created its systems originally for physicians and had dedicated a lot of time to understanding how hospitals send data. The goal of the workflow was to allow the senders of images – primarily physicians – to do the right thing the first time and prevent queries, which can delay clinical trials, from being sent back to them. “Our customers were reporting that their data caused significantly less queries than the data that was coming in in any other manner,” Gutman says. Since the release during 2008, AG Mednet has been awarded more than 850 clinical trials, and the system has over 45,000 registered users in more than 80 countries. Then AG Mednet decided to look at a different area of clinical trials – the area of adjudication, in which events in trials are examined and determined if the event that occurred was due to the drug being tested or other outside factors. Just like in the hospital-based clinical trials, AG Mednet took a look at the users of the adjudication system – which would be physicians working with CROs. “The adjudicator side of things, you in effect, and almost by default, are also significantly improving the process of the CRO and reducing costs for the sponsor, and reducing costs for the drug, which ultimately reduces cost all around and will eventually have an impact of what the cost of these drugs are ultimately going to be,” Gutman says. Since the launch of Judy, there are 14 different sponsors running 38 different protocols on the platform, according to Gutman. Another area that the company could possibly get into is digital pathology, which is important when trying to conduct global clinical trials involving China, as that country does not allow the importation of human body parts and blocks pathology slides from entering the country. When not pondering system problems or company challenges, Gutman, who was born and raised in Colombia, says he likes to listen to classical music, cook and bake (especially recipes learned from his mother and grandmother), and read about American history. AG Mednet’s office in Boston is on the Freedom Trail, two blocks from Paul Revere’s house. “And where I live, which is just a few blocks down, I go through the back of my building and I am where the Tea Party took place,” he says. C. David Nicholson, Ph.D., has been in pharma a long time. But when it comes to drug development, he is championing new thinking, not old tricks. Dr. Nicholson is a vocal proponent of Allergan’s Open Science initiative. In this system, Allergan looks at what’s going on in R&D outside of its walls, pulling in projects to develop and commercialize. And when it comes to appraising development possibilities, Dr. Nicholson has a lot of expertise. Trained as a pharmacologist, he served as chief technology officer and executive VP, R&D for Bayer CropScience from March 2012 to August 2014; senior VP of Licensing and Knowledge Management at Merck from 2009 to December 2011; and senior VP, responsible for Global Project Management and Drug Safety at Schering-Plough from 2007 to 2009. From 1988 to 2007, Dr. Nicholson held various leadership positions at Organon, where he most recently served as executive VP, R&D and was a member of the company’s executive management committee. Although Open Science was initiated when Actavis acquired Forest, it was brought up to scale in the wake of the Actavis-Allergan merger. Dr. Nicholson points to the metrics that back up Open Science: 72 percent of the world’s top 50 selling drugs are marketed by companies where they didn’t do the original invention. “We’ve just shown that open science is one very effective model for R&D,” he says. As Allergan’s chief of R&D, Dr. Nicholson works closely with Saunders, as well as Bill Meury – the head of Allergan’s commercial division – and others “to play our role in acquiring the molecules and building the pipeline,” he says. Allergan has six “star” products in development derived from its Open Science program. These are Esmya, abicipar, relamorelin, ubrogepant/atogepant, cenicriviroc, and rapastinel. Esmya is a progestin receptor agonist for the treatment of uterine fibroids. “If and when approved, it will be the first oral therapy in the United States for the treatment of uterine fibroids,” Dr. Nicholson says. Abicipar is a long-acting VEG-F that has completed Phase III for age-related macular degeneration, one of the leading forms of blindness. Dr. Nicholson says it differentiates itself from related agents because of its duration of effect. “People will have to be injected in the eye much less often with it than the present available therapy, which will be important for patient compliance and effectiveness of treatment,” he says. Relamorelin is being developed for the treatment of diabetic gastroparesis. “There hasn’t been an agent approved in this therapeutic area for 30 years,” he says. Ubrogepant is in Phase III clinical trials and atogepant is in Phase II for the treatment of migraine. “It’s a real innovation and an area of unmet need,” Dr. Nicholson notes. Phase III trials have just begun for cenicriviroc, which is an agent for NASH (nonalcoholic steatohepatitis). Rapastinel is a rapid acting antidepressant. “Most antidepressants, it takes four to six weeks to show efficacy,” Dr. Nicholson says. “Rapastinel in Phase II studies worked within hours, and in patients who hadn’t responded to previous therapy. It could be a huge breakthrough in the treatment of depression.” The drug is now in Phase III clinical trials. According to Dr. Nicholson, he sees Open Science as the future of pharmaceutical R&D, due to a number of factors. Some companies may struggle to institute an Open Science model, due to the attitude of “not invented here.” But that was never the case at Allergan. As a head of R&D, Dr. Nicholson believes in the power of teamwork.